The Mafia bribed NSW judges $2.2m a top secret police report alleges, Fairfax Media (The SMH and The Age) reported last night (6/7/15). The secret police report was not leaked to Fairfax Media for no reason and there will be a lot of people in the NSW legal fraternity having heart attacks as they know the game is up. The timing of the leak is perfect for this website and my complaint about corrupt NSW judges to the NSW Independent Commission Against Corruption (ICAC). One judge has apparently since retired but there are others who are still judges who also took the bribes off the mafia. There is possibly more on tonight’s Four Corners program titled “The Mafia in Australia: Blood Ties” – part 2 as they have worked with Fairfax Media on the story. But I have not watched it yet. If the judges take bribes off the Mafia who else do they take bribes from? Given the Mafia can bribe judges to the tune of $2.2 million then anyone with deep pockets can bribe judges. I made a complaint regarding judicial corruption to ICAC a while ago. I wrote an article about it but two weeks ago former ICAC investigator and corrupt judge Justice Stephen Campbell made me take it down on the instructions of Kerry Stokes and his son Ryan Stokes. 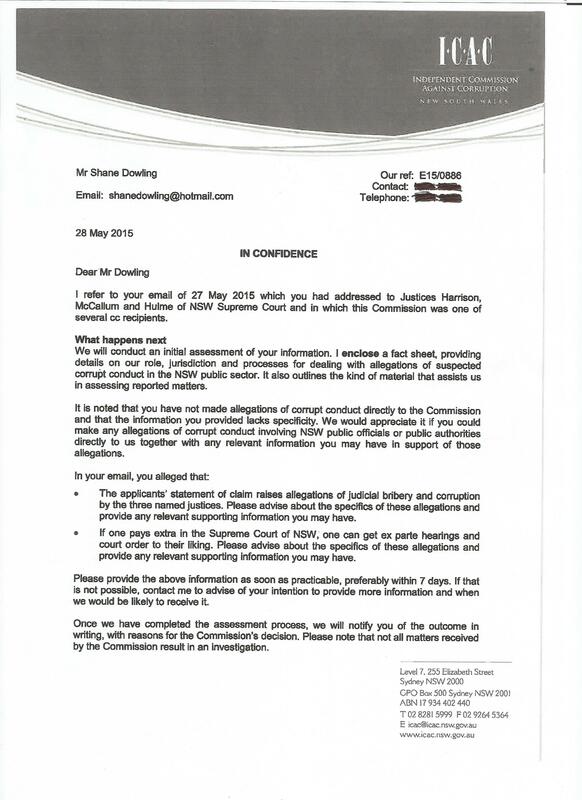 I received the below letter from ICAC and have had further communication with them since. The chances of ICAC having public hearings regarding my compliant of judicial corruption have just increased about 1000% I suspect. If they don’t they are going to be looking extremely corrupt themselves. I have phoned Chief Justice Tom Bathurst’s office quite a few times and sent him numerous emails regarding judicial corruption and he just ignores it. 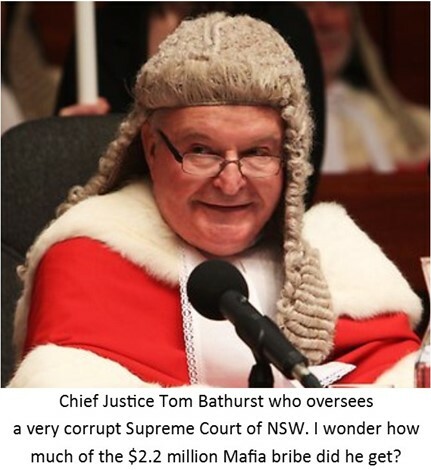 I can state for a fact that he is a major league crook and until he is gone corruption will flourish in NSW courts. Until there is an open and public inquiry every judge in NSW will be under suspicion. One would expect every honest judge to make a public statement demanding a public inquiry to clear their good names. If no honest judges come forward and demand an inquiry then the more reason one is needed. While my post on Sunday (5/7/15) titled “Former ICAC investigator Justice Stephen Campbell caught acting corruptly” (Click here to read) was not as popular with regular readers as some other posts I am sure it would have rattled at least a few people in power. They would not have liked the fact they this website is starting to dig very deep into the corruption network. Given this website’s major focus is judicial corruption and its associated matters this story was always going to be reported by this site. It goes a long way to confirm the allegations of wide spread judicial corruption that myself and others have been making for years. Premier Mike Baird is going to come under extreme pressure to have an inquiry into the judicial corruption and if he doesn’t it will be a clear cover-up. Or maybe he will refer it to ICAC. One thing is for sure is that the Mafia/judicial bribery story is a real game changer and things are just starting to heat up. Crime and corruption in many places rely on judicial corruption to survive and/or flourish. If you attack and minimise judicial corruption it will have a huge impact reducing corruption everywhere. There seems to have been an awful lot of secret high level reports. Upon being read by senior officers the reports have been put in the mafia/organised crime file with all the other mafia/organised reports from years gone by.Were these various reports placed in the hands of the state and federal police and justices ministers?If so why have they not been acted upon? It would appear that the scale of the M/OC activity is quite apparent to all concerned but nothing is being done except to keep on watching and listening and writing more reports.I can understand why the NSW police commissioners were not doing anything because they were to busy spying on each other !! Maybe we should hand over the investigation to the ABC and Fairfax because police and politicians seem to want to take the Nelsonian approach to the whole business. This from personal experience in NSW years back. A Barrister now deceased by the name of Don Geddes, who later became Labor Mayor of Newcastle until the government had to step in and sack the entire corrupt council and appoint a manager, would get you off any charge for the right price. He was blatantly open about it checking which judge would hear your case and telling you how much you needed to pay him to dismiss it. I never paid him myself but my best mate at the time handed over the cash on more than one occasion to get off. Rex Frederick Jackson was NSW Minister for Corrective Services from October 1981 to October 1983 and took bribes to let prisoners out early and was imprisoned for conspiracy. He only ever faced the one charge but let many prisoners out early. The District Court found that Jackson accepted a bribe of A$12,000 in 1983 and that he conspired to organise the early release of three prisoners from Broken Hill Correctional Centre to meet gambling debts. The Supreme Court judges have no credibility, but I doubt that ICAC will do much about it. As to Margaret Cunneen’s case, ICAC held an internal hearing within 5 weeks (I think). I wonder how they are going to act now. I am going to request a Senate inquiry into this $2.2 million bribery. Shane, I just would like to know whether senators are required to respond to such requests from their electorate. They should respond to all mail. Give it a go and see what happens. This goes for a very long time…. Griffith…. Bob Trimbole ….. Al Grassby ….. Lionel Murphy ect..ect.. The suspected murder and disappearance of the body of Don Mackay, a Griffith business owner and member of the Liberal Party of Australia. The suspected murder and disappearance of the body of King Cross newspaper editor Juanita Neilsen …… of many. Mafia bribes go all the way to the top. They bribed the Liberal Party to stop one of their crooks from being deported. Amanda Vanstone was the one involved when she took over the position of Minister for immigration fro Phillip Ruddock. Ruddock had previously upheld the decision to deport the Mafia member which Vanstone overturned. The only difference here was the $10,000 bribe was in the form of a donation to the Liberal Party. History tells us “When society loses faith in it’s Judicial system you get Anarchy” Maybe some History books sent to NSW Judges would get a Royal Commission? !